In this article we will go through different network commands for Windows and Linux, this is essential for any network Administrator. These network commands, can be used separately or can be combined with Pandora FMS to monitor in real time, or as part of a long-term strategy. This post along with the network tools one, will serve to better manage your network and your time. If you do not know about Pandora FMS, we invite you to visit our website. But if you are already familiar with this tool, you’ll know that Pandora FMS stands out for its flexibility, therefore it is not surprising that it allows you to create and personalize monitoring plug-ins. With these commands that we will see today, you can create plug-ins in order to facilitate your work, and also suit the tool to your needs. It is one of the most complete network commands. It works on all Linux and BSD systems, and allows us to monitor network traffic from the console. Installation is simple and fairly quick, allowing monitoring of all network interfaces. With VNStat we can collect all traffic needed from any configured interface. One of the big differences between VNStat and other tools is that VNStat collects kernel data instead of the interface itself, which means a lighter execution for the system. It will not require administrator permissions to run. It has the ability to store gathered information so your information never goes missing, even if the system crashes or reboots itself. You can set Vnstat to listen to traffic, daily or by billing period, as well as many other options. It stands out for its flexibility when configuring the reading of traffic. Finally, it is possible to set Vnstat output to generate console graphics and even customize them with colours. If there is connectivity between your machine and another machine on the network. It’s used to measure the “speed” or latency time. It is a command that exists on all operating systems that support TCP/IP, and it is a basic command that you should know. Ping is known for having dozens of parameters and the one that we find more useful is the one responsible for monitoring “the number of packages to send.” There are networks that undo the first package, so it is essential to send at least three so we can check that at least one has arrived without being discarded. For this we use the -c parameter. The main objective of this tool is to know the travelling path of a package through our network. This network command will tell us where the package is going through (machines, switches, routers) and check that our network is working properly. If you encounter any problems, it will allow us to have a rough idea about where the fault lies. Pandora FMS uses this in its network-mapping tool (Recon Server) and thanks to this, along with other advanced tools, you can “draw” a hierarchy of the network. This network command is used to change and view the ARP table, which contains the mappings between the IP address and the MAC address. It only sees the connections in our local area network segment (LAN), so it could be called “low level”. However, it’s used to discover what machines are directly connected to our host or what machines we are connected to. It is a diagnostic tool, and sometimes it can be interesting to monitor it in order to discard ARP Poisoning attacks, which are one of the most common forms of phishing attacks in local networks. 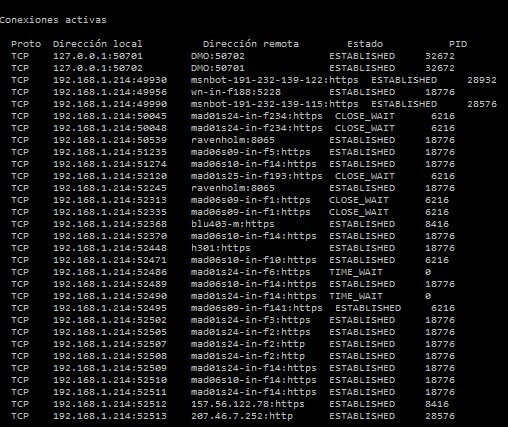 With Pandora FMS, a common integration is to check on some hosts, if the IP and MAC connection is always the same. If it suddenly changes, it is because a host on the network is impersonating another. These are essential commands to do HTTP, HTTPS or FTP requests to remote servers. It allows you to download files or whole web pages, even recursively (it literally allows us to make a “copy” of a website, including images). It supports cookies and allows you to send POST requests, in addition to “simulate a” user agent, use a http proxy or even a SOCKS4/5 proxy. One of the most common utilities in integration with Pandora FMS, is to verify the contents of a specific web page. Because wget / curl allows us to download the entire contents of a web, it is easy to compare the MD5 of that content with a value previously verified. If it changes, it means that the Web has been altered. Routing tables to meet our network interfaces and its outputs. Ethernet statistics that show sent and received packages and possible errors. To know the id of the process that is being used by the connection. Netstat is another basic command as Ping that meets many elementary functions. Some of the elements, that Pandora FMS agents use to get information of the system, are the traffic statistics, the number of open connections and most importantly, the number of closing pending connections or in a settlement process. An unusual growth in these metrics can be a serious problem , and it may be due to a performance problem on our server or even an external attack. This network command is used to query data domains: to find out who owns the domain, when that domain expires, to view the configured logs, contact details, etc. Its use is highly recommended to contact the administrators of the domains or when incidents of migration of services such as mail and web happen. You can also look through their website. Command to run terminals on remote machines safely. SSH allows any user to run a console just by registering and entering his credentials. So you can run the commands you want as if you were in local. To enable a remote computer to connect to our server via SSH, an SSH server must be installed and set up as FreeSSHd. SSH also allows to obtain an interactive remote Shell, execute remote commands and copy files in both directions. Last but not least, SSH is the natural replacement of classic tools like Telnet or FTP, and has become a basic tool in the administration of systems over the years. It is extremely powerful despite its complex combinations of symmetric encryption and authentication schemes, and verification, and it is the target of continuous attacks. Pandora FMS uses SSH in different ways, and gives you the possibility to run remote commands. For security, we need the user to establish an authentication scheme based on certificates, which allows remote execution connections from a machine so that these connections can be made without requiring any password. It’s convenient, but something complex to implement. Therefore, in the Enterprise version, our satellite server allows multiple remote executions to different hosts in a much more optimized and comfortable way. This allows us to make hundreds of checks per second. It is one of the “basic” tools of network commands, and when used right, goes on to become a great ally for network administrators, system administrators or programmers. TCPDump is an advanced command used to inspect traffic from different interfaces of a machine so you can get the exchanged packages. You can dump output to file so then you can analyse it with more powerful sniffers and graphical interfaces such as Wireshark. For Windows, you must use WinDump. The grep command power is taken to the network. It is a TCPDump with a substring text filter in real time. It has a very powerful filtering system for regular expressions and it is typically used to process files generated by tcpdump, wireshark, etc. It is a communication package filter over HTTP, SMTP, FTP, DNS and other protocols. NMAP is considered the father of the general network scanners. Although today there are more reliable tools for some tasks (like Fping), NMAP is a very versatile tool for scanning networks. It is used to determine which hosts are alive in a network and to do different ways of scanning. The ‘lsof’ command is not only used as a network tool, but also is used to identify which files have an open process. In Unix environments, a file can be a network connection, so that is used to know which ports have an open particular running process, something extremely useful in specific cases. It can also be used to find out how many open files a process has, it has nothing to do with the network, but it sure can be helpful. Special command to obtain traffic statistics. It has a ncurses interface (text) to analyse real-time traffic passing through an interface. It allows you to work at low-level and to see what pairs of connections are established on each machine, and to see in detail the traffic connection of every pair, all in real time. It is very useful if you notice something wrong with your machine and you do not know what traffic is going through it. We hope this list of network commands was of interest to you. Are you missing a network command? Do not hesitate to let us now so we can include it in this list. In your explanation about the ping command in the section "Ping (Unix/Windows)", you will want to replace the word "package" with "packet". As ICMP is used to verify Layer 3 connectivity, you are working with packets. Thanks Marcus for the feedback. I guess some problems with the correction system should have changed it. Thanks!